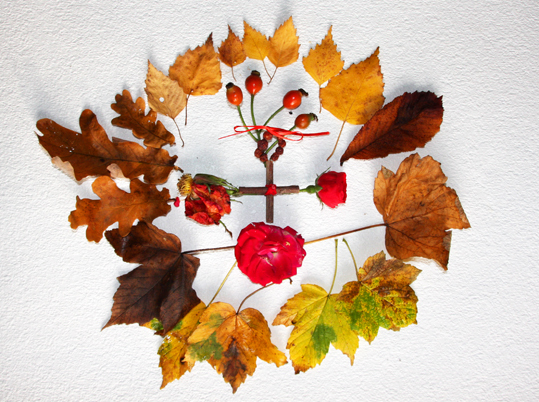 Here is my mandala for the month of November, showing fallen leaves from my garden along with roses - the only flowers still blooming there - and a rowan cross that was given to me by a friend earlier this year. One of my new year resolutions for 2017 was to create a mandala each month including things from my own garden to show the changing seasons. I was inspired to do that after I made a mandala for the front cover of a book I edited last year - Every Day Magic: A Pagan Book of Days. That mandala used natural and found items, jewellery and trinkets that held a personal meaning for me. I enjoyed creating that mandala and it helped me explore the cycle of the seasons in a personal way, both from learning more about my own garden in a search for suitable things for the craft project and thinking about what the Wheel of the Year actually means to me. My mandala for November feels very much about the Wheel of the Year as autumn ends and winter starts. The leaves are mostly brown now, but the roses include a bud, a full bloom, dying petals and rose hips. The rowan cross is a symbol of protection and traditionally the sticks would be gathered in springtime, but the berries gathered and dried in the autumn. A cross within a circle is more than just a Christian symbol - it also represents the cycle of life and all the elements in balance. You can view the book Every Day Magic: A Pagan Book of Days on Amazon and it was published just a few days ago, on November 24.